This page gives an introduction to the Bernoulli numbers and polynomials, as well as to the Euler numbers. Besides some basic results, one also finds some special and advanced properties. For the computation of the Bernoulli numbers up to the huge index 107 see the program CalcBn V3.0 below. For further reading see the list of books at the end. See here for News & History. The sequences of the numerators and denominators of Bn are A027641 and A027642, respectively. Jacob Bernoulli Bernoulli1713 (1655-1705) introduced a sequence of rational numbers in his Ars Conjectandi, which was published posthumously in 1713. He used these numbers, later called Bernoulli numbers, to compute the sum of consecutive integer powers. where Sn(x) is a polynomial of degree n &plus; 1.
with S2(n, k) being the Stirling numbers of the second kind. In 1850 Kummer Kummer1850 introduced two classes of odd primes, later called regular and irregular (see, e.g., Hilbert Hilbert1897;Chap.~31). has no solution in positive integers x, y, and z, for the case when the exponent n is a regular prime. If p does not divide any of the numerators of the Bernoulli numbers B2, B4, …, Bp−3, then p is regular. The irregular primes below 100 are 37, 59, and 67; see A000928. In 1915 Jensen Jensen1915 proved that infinitely many irregular primes p exist with the restriction p ≡ 3 (mod 4). Carlitz Carlitz1954 later gave a short (and weaker) proof without any restriction on p.
Unfortunately, it is still an open question whether infinitely many regular primes exist. However, several computations (see, e.g., Hart, Harvey, and Ong HartHarveyOng2017) suggest that about 60% of all primes are regular, which agree with an expected distribution proposed by Siegel Siegel1964. The pair (p, &ell;) is called an irregular pair, if p divides the numerator of B&ell; where &ell; is even and 2 ≤ &ell; ≤ p − 3. The index of irregularity i(p) is defined to be the number of such pairs belonging to p. If i(p) &equals; 0, then p is regular, otherwise irregular. The first irregular pairs are (37, 32), (59, 44), and (67, 58). The irregular prime p &equals; 157 is the least prime with i(p) &equals; 2: (157, 62), (157, 110). As a consequence, the denominator is squarefree and divisible by 6.
implying that the numbers Bm have the same denominator as Bn. See A112772, which is a subsequence of A051222; the sequence of the increasing denominators is A090801. The additional left product is a trivial factor of Bn that divides n, see A300711. For the signed numerators of Bn and Bn/n for even n see A000367 and A001067, respectively. The Kummer congruences describe the most important arithmetical properties of the Bernoulli numbers, which give a modular relation between these numbers. 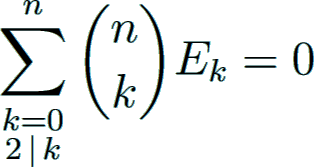 Let φ denote Euler's totient function. Let n and m be positive even integers and p be a prime with p − 1 ∤ n.
In 1851 Kummer Kummer1851 originally introduced these congruences without the Euler factors (1 − pn−1) and hence with restrictions on r and n. He showed that the second congruence holds for n > r, whereas the first congruence was derived from the latter only for r &equals; 1 (in these cases the Euler factors vanish). Subsequently, these congruences were widely generalized by several authors (see, e.g., Fresnel Fresnel1967). The values ζ(1 − n) &equals; −Bn/n and the Kummer congruences lead to the construction of p-adic zeta and L-functions, as introduced by Kubota and Leopoldt KubotaLeopoldt1964 in 1964. One kind of their constructions deals with p-adic zeta functions defined in certain residue classes; for a detailed theory see Koblitz Koblitz1996;Chap. II. for p-adic integers s by taking any sequence (tν)ν ≥ 1 of nonnegative integers that p-adically converges to s. Indeed, this function is well-defined and has the following properties. when s ≡ s' (mod pr−1) for nonnegative integers s and s'. Since &Zopf; is dense in &Zopf;p, the function ζ(p,&ell;)(s), restricted on nonnegative integer arguments, uniquely extends, by means of the Kummer congruences and preserving the interpolation property, to a continuous function on &Zopf;p.
then the p-adic zeta function ζ(p,&ell;)(s) has a unique simple zero ξ(p,&ell;) &in; . So far, no irregular pair (p, &ell;) has been found that the non congruence relation above holds as a congruence. For more p-adic digits see Kellner Kellner2007 and A299468. The irregular pairs of higher order describe the first appearance of higher powers of irregular prime factors of Bn/n. An irregular pair (p, n) of order r has the property that pr divides Bn/n with n < φ(pr) &equals; (p − 1)pr−1. For r &equals; 1 this gives the usual definition of irregular pairs, since the condition p divides Bn/n is then equal to p divides Bn. A zero of the p-adic zeta function ζ(p,&ell;)(s) describes the irregular pairs (p, n) of higher order with n ≡ &ell; (mod p − 1), and vice versa (Kellner Kellner2007). Irregular pairs of higher order can be effectively and easily computed using Bernoulli numbers with small indices. By this means one can even predict the extremely huge index of the first occurrence of the power 3737 as listed above; see A251782. and |¢erdot;|p is the ultrametric p-adic absolute value. The first product gives the trivial factor, the second product describes the product over irregular prime powers, and the third product yields the denominator of Bn. This follows by computations of irregular pairs and cyclotomic invariants in that range by Hart, Harvey, and Ong HartHarveyOng2017. So far, no counterexample is known. Let h(d) denote the class number of the imaginary quadratic field of discriminant d < −4. There is the following connection with the Bernoulli numbers due to Carlitz Carlitz1953. using the well-known relation that h(−p) < p. This implies that p cannot divide the above Bernoulli number. Therefore, an irregular pair (p, (p &plus; 1)/2) cannot exist when p ≡ 3 (mod 4). where the sum runs over all even unimodular lattices Λ in dimension n and Aut(Λ) is the automorphism group of Λ.
where is the Glaisher-Kinkelin constant A074962 and is the product over all Riemann zeta values at even positive integer arguments A080729. are integral for odd and even n (A286516 and A286517), respectively. A prime p is called E-irregular, if p divides at least one of the Euler numbers E2, E4, …, Ep−3; otherwise p is E-regular. The pair (p, &ell;) is called an E-irregular pair, if p divides E&ell; where &ell; is even and 2 ≤ &ell; ≤ p − 3. The index of E-irregularity iE(p) is defined to be the number of such pairs belonging to p.
The first E-irregular pairs are (19, 10), (31, 22), and (43, 12); see A120337. The E-irregular prime p &equals; 241 is the least prime with iE(p) &equals; 2: (241, 210), (241, 238). In 1954 Carlitz Carlitz1954 proved that infinitely many E-irregular primes exist. Later Ernvall Ernvall1975 showed the more specialized result that infinitely many E-irregular primes p ≢ &pm;1 (mod 8) exist. As in the case of the Bernoulli numbers, it is still an open question whether infinitely many E-regular primes exist. For the Euler numbers one can state a similar conjectural formula as in the case of the Bernoulli numbers, though it is a bit more complicated. where ξ(p,&ell;) is the unique simple zero of a certain p-adic L-function associated with an E-irregular pair (p, &ell;) &in; when &ell; ≠ 0, respectively, with a rare exceptional prime p with (p, 0) &in; in case &ell; &equals; 0. Let h(d) denote the class number of the imaginary quadratic field of discriminant d < −4. Due to Carlitz Carlitz1953 one has the following connection with the Euler numbers. 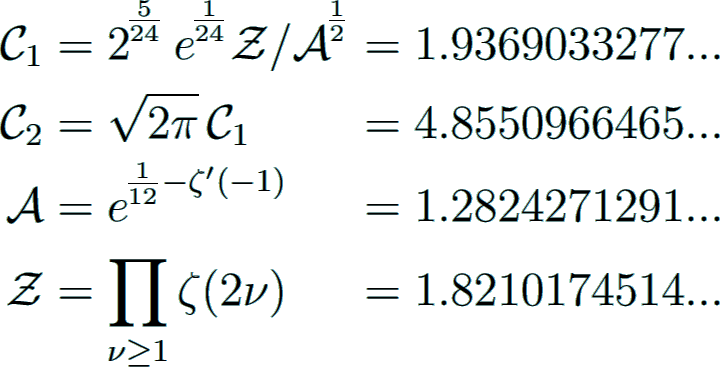 using the well-known relation h(−4p) < p. Therefore p cannot divide the above Euler number. Consequently, an E-irregular pair (p, (p − 1)/2) cannot exist when p ≡ 1 (mod 4). CalcBn V3.0 is a multi-threaded program for computing the Bernoulli numbers via the Riemann zeta function. It uses special optimizations such that the main part of calculation can be performed by integer arithmetic. CalcBn depends on the GMP library, so it is recommended to use the latest version of GMP with possible optimizations for the current hardware. The source code of CalcBn for 32/64-bit Linux and Windows complies with C++11. It is released under the terms of the GNU Public License. Factorizations of the numerators of the Bernoulli numbers, respectively, the Euler numbers with even index 2 to 10 000. Computed prime factors are less than one million, except for known greater prime factors. Computed irregular pairs (p, &ell;) for primes below 20 000. Number of digits of the numerator / denominator: 4767554 / 24. Number of digits of the numerator / denominator: 7415484 / 55. Number of digits of the numerator / denominator: 10137147 / 31. J. Bernoulli, Ars Conjectandi, Basel, 1713. L. Carlitz, The class number of an imaginary quadratic field, Comment. Math. Helv. 27 (1953), 338-345. L. Carlitz, Note on irregular primes, Proc. Amer. Math. Soc. 5 (1954), 329-331. T. Clausen, Lehrsatz aus einer Abhandlung über die Bernoulli­schen Zahlen, Astr. Nachr. 17 (1840), 351-352. R. Ernvall, On the distribution mod 8 of the E-irregular primes, Ann. Acad. Sci. Fenn., Ser. A I, Math. 1 (1975), 195-198. J. Fresnel, Nombres de Bernoulli et fonctions L p-adiques, Ann. Inst. Fourier 17 (1967), 281-333. W. Hart, D. Harvey, and W. Ong, Irregular primes to two billion, Math. Comp. 86 (2017), 3031-3049. D. Harvey, A multimodular algorithm for computing Bernoulli numbers, Math. Comp. 79 (2010), 2361-2370. D. Hilbert, Die Theorie der algebraischen Zahlkörper, Jahresber. Dtsch. Math.-Ver. 4 (1897), 175-546. K. L. Jensen, Om talteoretiske Egenskaber ved de Bernoulliske Tal, Nyt Tidss. for Math. 26 (1915), 73-83. B. C. Kellner, On irregular prime power divisors of the Bernoulli numbers, Math. Comp. 76 (2007), 405-441. B. C. Kellner, On Asymptotic Constants Related to Products of Bernoulli Numbers and Factorials, Integers 9 (2009), Article A08, 83-106. B. C. Kellner, On a product of certain primes, J. Number Theory 179 (2017), 126-141. B. C. Kellner, Distribution modulo one and denominators of the Bernoulli polynomials, preprint, 1708.07119, Aug. 2017. B. C. Kellner and J. Sondow, Power-sum denominators, Amer. Math. Monthly 124 (2017), 695-709. B. C. Kellner and J. Sondow, The denominators of power sums of arithmetic progressions, Integers 18 (2018), Article A95, 1-17. T. Kubota and H. W. Leopoldt, Eine p-adische Theorie der Zetawerte. I: Einführung der p-adischen Dirichletschen L-Funktionen, J. Reine Angew. Math. 214/215 (1964), 328-339. E. E. Kummer, Allgemeiner Beweis des Fermatschen Satzes, daß die Gleichung xλ+yλ=zλ durch ganze Zahlen unlösbar ist, für alle diejenigen Potenz-Exponenten λ, welche ungerade Primzahlen sind und in den Zählern der ersten &half;(λ-3) Bernoullischen Zahlen als Factoren nicht vorkommen, J. Reine Angew. Math. 40 (1850), 131-138. E. E. Kummer, Über eine allgemeine Eigenschaft der rationalen Entwicklungscoëfficienten einer bestimmten Gattung analytischer Functionen, J. Reine Angew. Math. 41 (1851), 368-372. R. Rado, A note on the Bernoullian numbers, J. Lond. Math. Soc. 9 (1934), 88-90. C. L. Siegel, Zu zwei Bemerkungen Kummers, Nachr. Akad. Wiss. Göttingen, II. Math.-Phys. Kl. 6 (1964), 51-57. K. G. C. von Staudt, Beweis eines Lehrsatzes die Bernoulli­schen Zahlen betreffend, J. Reine Angew. Math. 21 (1840), 372-374. S. S. Wagstaff, Jr., Prime divisors of the Bernoulli and Euler numbers, Number theory for the millennium III, Proceedings of the millennial conference on number theory, (2002), 357-374. J. Worpitzky, Studien über die Bernoullischen und Eulerschen Zahlen, J. Reine Angew. Math. 94 (1883), 203-233. H. Cohen, Number Theory, Volume II: Analytic and Modern Tools, GTM 240, Springer-Verlag, New York, 2007. K. Ireland and M. Rosen, A Classical Introduction to Modern Number Theory, 2nd ed., GTM 84, Springer-Verlag, New York, 1990. N. Koblitz, p-adic Numbers, p-adic Analysis and Zeta-Functions, 2nd ed., GTM 58, Springer-Verlag, New York, 1996. V. V. Prasolov, Polynomials, D. Leites, transl., 2nd ed., ACM 11, Springer-Verlag, Berlin, 2010. L. C. Washington, Introduction to Cyclotomic Fields, 2nd ed., GTM 83, Springer-Verlag, New York, 1997. © Bernd C. Kellner, Göttingen, Germany, 2018.